Today Markko is more of a system designer. His new favourite toy is a time planning tool called Hourdini, that helps to keep an eye on things in the way that makes you get everything done and by deadline as a bonus. He is also an active party in a new investment space called Funderbeam and acts as a consultant for many other endeavours. And recently as a fun distraction in between all these jobs he came up with an up-made T-shirt collection in cooperation with Reet Aus, the design of which is a modern view on our familiar national lions – a design he made for Estonian government but was left unused. In addition to his many talents Karu is also a brilliant product designer who values function before anything and settles with nothing less than the perfect outcome. And this approach I also find close to my heart. 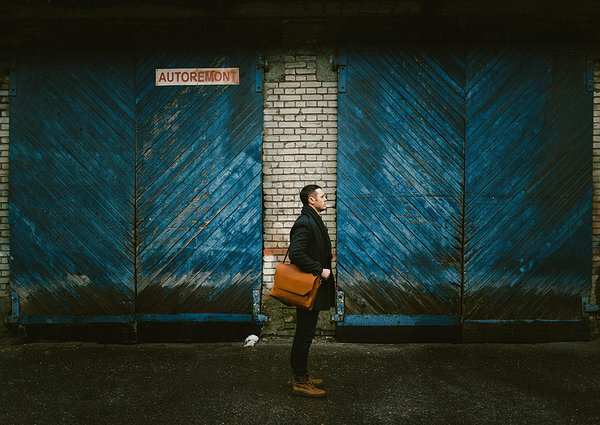 I am very technical when it comes to starting a bag – purpose and function come first and no compromises in achieving the absolute best result. And obviously it was that very combo that made it an exciting challenge to design a bag not just for him but rather with him. At the first glance it is a simple bag. 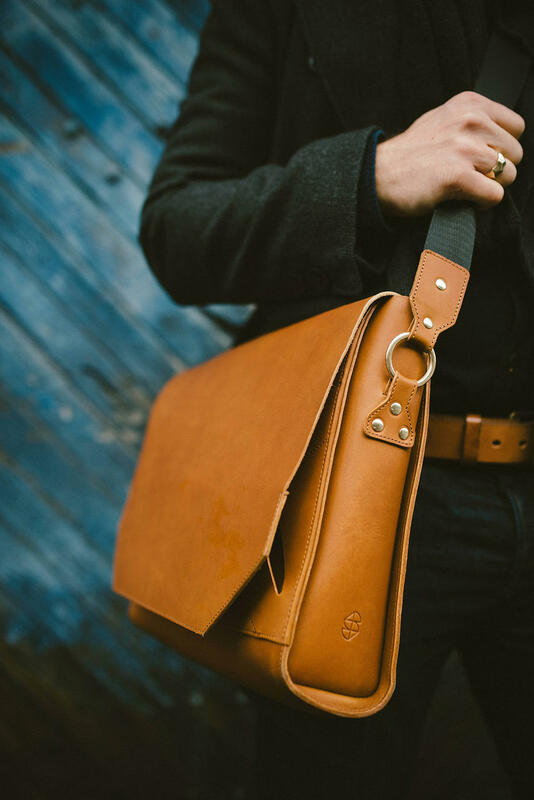 It looks like a classic messenger bag with a classic leather tone and shine to it. 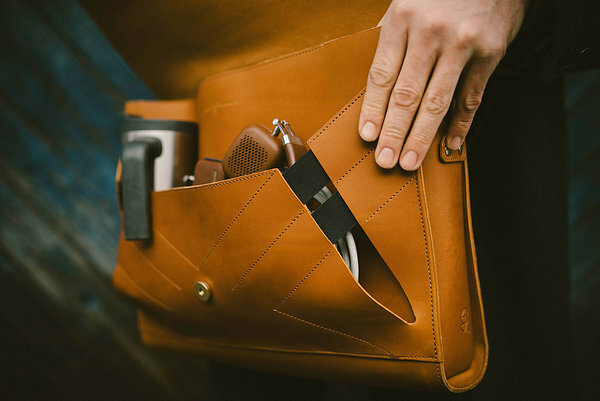 But when you raise the flap it reveals a magic adjustable pocket, where he can easily tuck either his bike lock or his coffee mug! The pocket is adjusted with rubber bands that make room for oh yes - everything. 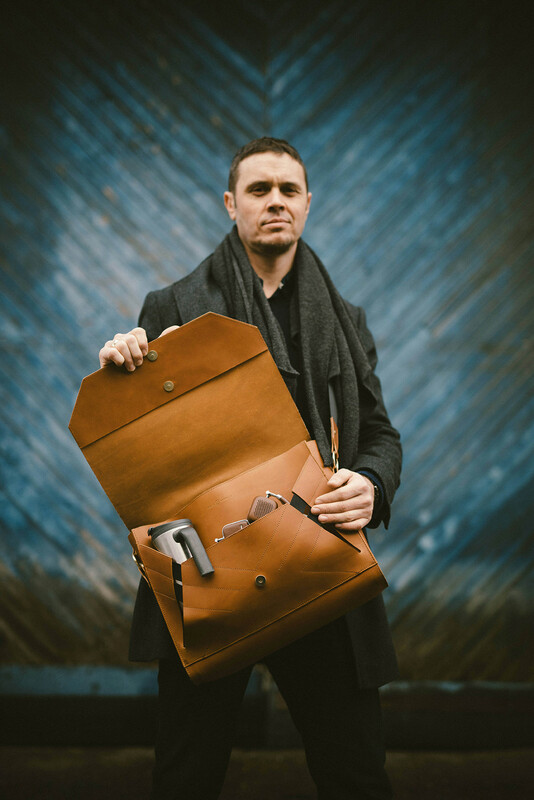 But there are days when Markko leaves the house without his bike and his cup of coffee already happily absorbed – well that’s when the pocket stays nice and still leaving the bag sleek and slim for the light traveller. However, the final solution was not the first to pop into our minds. For quite some time we tried out a design with zippers instead, but every problem we solved seemed to lead us yet to the next one and finally we just decided to discard the zippers. Initially I had eliminated the thought of using rubber bands because in my experience it has always been a slippery road to take – it looks as an easy solution but can just as easily make the end result look cheap. But two heads are always better than one as they say and this time the risk paid off. At least we think so! And that goes both for the bag and the logo! If you wish to know what road Markko had to take to lead him to my new logo, you can read about it here. The ever so manly pictures are taken by Tõnu Tunnel.